Under “Using GPS to Map Bones“, we described the procedure for recording the 3D position of each bone as it was excavated from the quarry. These GPS data, accurate to a few millimeters, are not only used to reconstruct the quarry (See How to Reconstruct a Dinosaur Quarry), but the same data can now be used to pinpoint each bone in the resulting quarry map. 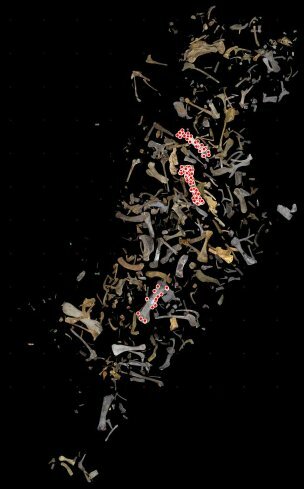 This remarkable capability enables us to visualize the position of any excavated bone, tooth, tendon or fragment of bone in the context of all of the other bones removed from that quarry. Thus you can choose to find where a given femur (the long bone in your upper leg) was excavated relative to any other femur or relative to all femora (plural of femur) in a given quarry. Above is an example of how the mapping function works. 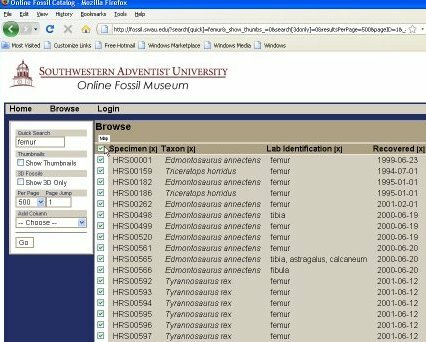 This is a screen capture of the Museum Fossil Catalog illustrating a search on “femur.” Choosing all results by clicking on the box at the top of the column (see mouse pointer in upper left of light brown area) and selecting the “map” button just above it results in a display of each quarry containing femora. The femora will be highlighted with red dots, indicating the GPS positions for that femur. The resulting output is a series of quarry maps, one for each quarry in which the designated object was found. Within the quarry maps those objects selected, in this case “femur”, will be highlighted with red dots. The map for one of the quarries is shown to the right with the femora highlighted as indicated. Of course if you were to select a single bone, only the map for the quarry containing that bone would be displayed, and only that bone would be highlighted. By building this capability into the Museum website, we are seeking to make certain the integrity of all taphonomic information in a public venue that assures other scientists access to it at any time. It also gives a degree of security to the scientific community that the records will not be lost in a dusty basement somewhere and the data will outlive any of the current participants.